In November, 2017, the LAND Project hosted its second international symposium, “The Agroecology of Development: Community Solutions in Post-Apartheid South Africa.” The event was sponsored by the University of Wisconsin Lectures Committee, The Center for Integrated Agricultural Systems, the Department of Agroecology, the Department of African Studies, and Kidlinks World. Professor Michael Aliber and Farmer Field School Leader Asanda Apleni from the Agricultural and Rural Development Research Institute (ARDRI) at the University of Fort Hare in South Africa travelled to Madison to share their work. The focus of the event was policy and projects related to rural development and agriculture. Students, faculty, and community members were invited to the talks and welcomed for a reception afterward. The visiting presenters also attended a LAND Project workshop and met with other groups on campus. 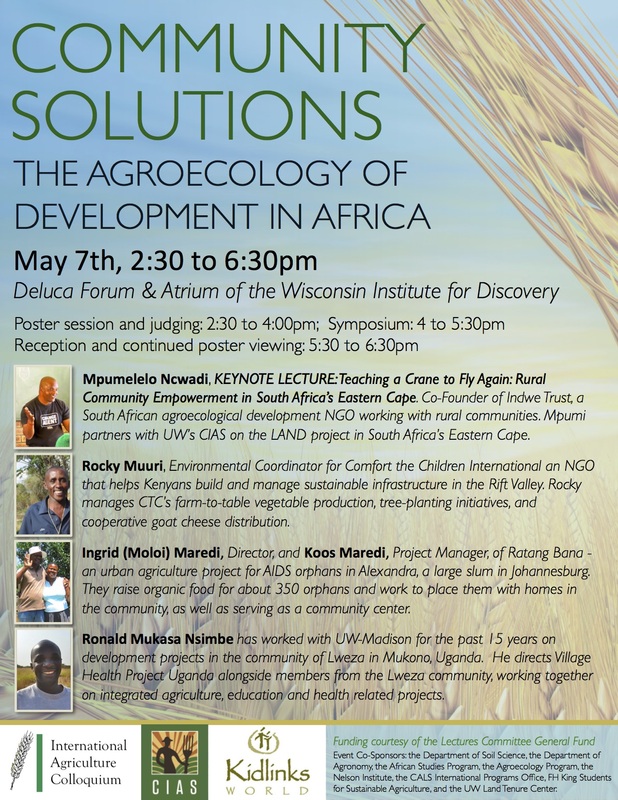 In the spring of 2015, CIAS partnered with Kidlinks World and the International Agriculture Colloquium, a student group on the UW Madison campus, to offer a unique symposium: Community Solutions: The Agroecology of Development in Africa at the Deluca Forum in the Wisconsin Institute for Discovery (WID) building. This exciting event featured five speakers who live and breathe community agriculture across Africa. From South Africa to Kenya to Uganda, we heard about the experiences, challenges, and successes of agricultural development efforts in both urban and rural contexts. This symposium was formed to foster cross-cultural understanding and shared learning as we explore agroecological development from multiple angles. In tandem with the symposium, there was a poster session titled Africa’s Changing Face of Development, featuring UW work from a variety of disciplines, and offering a forum to feature student research and to unite oft separated parts of campus that are working with agriculture internationally using different approaches.